Earlier this year we took a 2015 Dodge Challenger SRT Hellcat out to Auto Club Speedway in Fontana, California to do a few lapping sessions, but we hadn’t planned on creating a wake while heading down the oval. 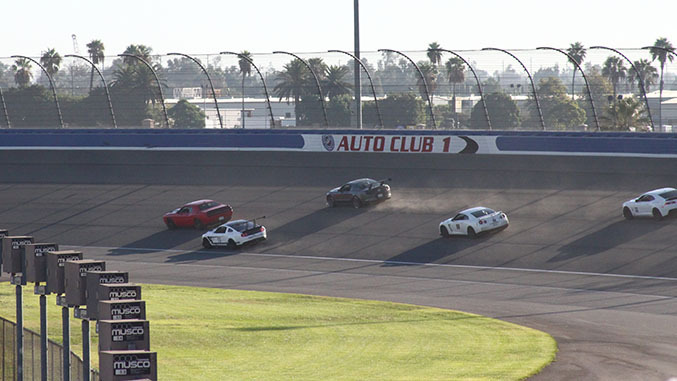 Having a similarly optioned car over the course of summer, fall and a bit of winter has afforded us some flexibility in terms of timing, so we were able to head back to Fontana under fairer weather to give the big coupe another shot at Auto Club’s sportscar course. But first, by mere happenstance, we found ourselves at Streets of Willow with the Challenger. While we were out at the course over the summer to check out the new MX-5 Cup car, we got word that the SCCA also happened to be running a Track Night in America event on the course later that day. 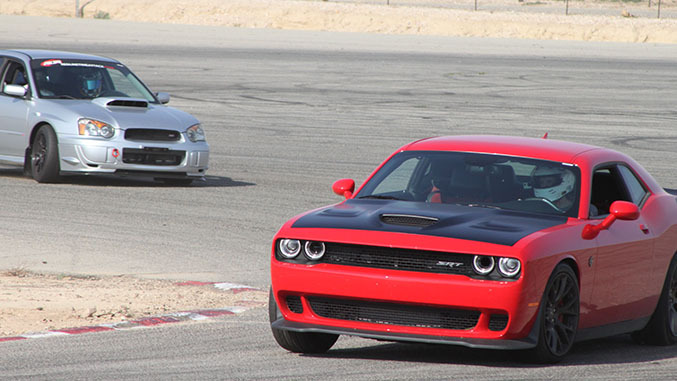 We’ve been here before and while your author rode shotgun on our previous visit, this time around would be a hands-on experience, and Hellcat would be the vehicle getting put through its paces. 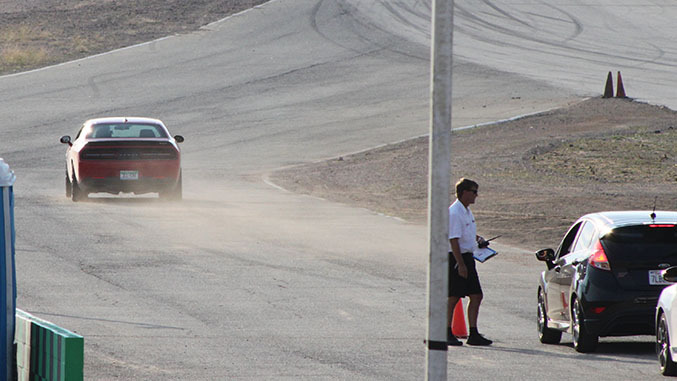 That particular day at Willow Springs was a scorcher, with temperatures climbing well into the triple digits by mid-day – not ideal supercharger weather. 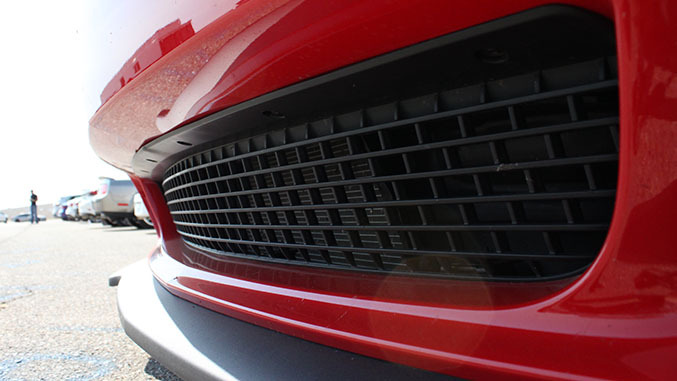 With that in mind, we took a look at what is involved in removing the grill that’s installed in front of intercooler. We remembered from our initial introduction to the Hellcat that reps from Dodge had explained that removing this for track use was a fairly easy task – just a few screws. Upon closer inspection however, removing the grill appears to also require removing the belly pan underneath the car so that you can access the clips on the underside of the grill. Those are located behind the grill rather than in front of it, like those aforementioned screws. While removing the belly ban is not a Herculean task, it wasn’t something we wanted to embark on while sessions were about to begin, and likely much easier to tackle with the car in the air. This seems like a job that’s better suited to be done before heading to the track rather than while you’re there – unless you’re already planning on bringing a reasonable assortment of tools (as you probably should anyway). But despite our best efforts, heat soak was never a factor. The hot ambient temps undoubtedly took a toll on the 6.2-liter’s peak output, but the car never seemed to dial back power when we asked for it, nor did it choke on the straights. To be fair though, straight line speed is not what Streets of Willow is all about. While smaller than Big Willow at 1.6 miles and generally narrower, Streets of Willow is a much more technical course that offers little forgiveness for poorly setup cars and ham-fisted driving. 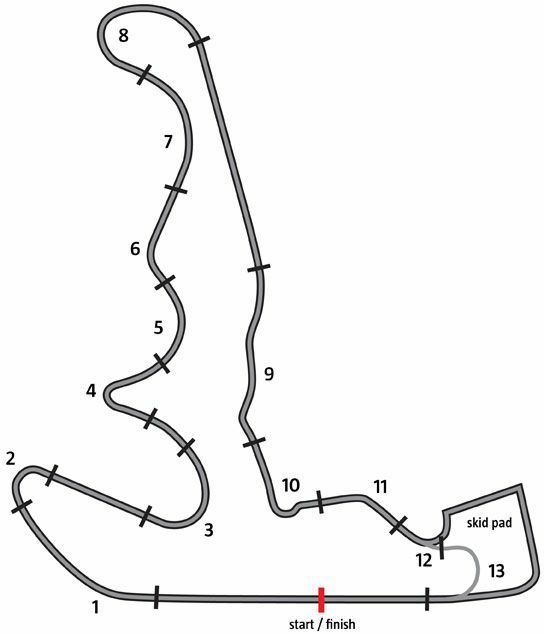 Its fourteen turns offer a wide range of different handling challenges, and its steeply banked hairpin – also known as The Bowl – is notorious for pushing vehicles off track if approached incorrectly with too little grip. As far as road courses go, Streets of Willow is practically designed to exploit the Challenger’s weaknesses – this is a course that makes a BMW E46 feel big – and there’s little opportunity to go wide open throttle in high horsepower cars. Despite this, the Hellcat still provided plenty of entertainment and a level grip that continues to surprise us. During a recent chat with an SRT engineer, we asked about the decision to stick with hydraulically assisted steering specifically in the Hellcat Challenger and Charger, rather than moving to an electric unit like the rest of the LX cars have. This was initially explained as a packaging issue. As it turns out, the real story is that when development of the car began, the folks at SRT simply weren't satisfied with the amount of feedback that the early generation electric racks were providing at that time and opted against it. We're glad they did. While electrically assisted racks have come a long way in just a few years, there's a level of intuition provided by a good hydraulic unit that's still absent from the majority of its electric counterparts. When we made our way back to Auto Club Speedway a few weeks ago the weather proved to be a far cry from our previous visit, with sunny skies and near-ideal temperatures in the low 70s. As we theorized before heading out to Fontana the first time around, this is the kind of course where the Hellcat thrives – wide dimensions, fast corners, and plenty of opportunities to lay into the throttle. The car is also remarkably stable at high speeds. Dodge says the Challenger SRT Hellcat spent 35 percent more time in the wind tunnel refining its aerodynamics than on previous models, and heading down the high speed oval section at over 150 mph we were certainly thankful for it. It also makes the thought of reaching the car’s top speed, which is right around 200 mph, seem like a realistically attainable achievement (given you have enough road to do so). Perhaps most importantly, throughout both sessions the Challenger didn’t so much as hiccup – the car simply exhibited no untoward behavior. Taller drivers might wish for a little more padding on underside lip of the center console, as your author’s right knee gets a bit bruised up after repeating bracing against the center section during high speed cornering. But now we're just nit-picking. While the Challenger might not be an ideal platform for a corner carving road course terror – and what vehicle with a trunk this size and room for five people is – from a capability standpoint, the SRT Hellcat is happy to run laps all day without brake fade, power loss, or any other indicators that it needs a rest. You will run out of steam before the car does. Just be sure to factor in a few extra sets of tires into your annual budget. + WR Long Term Garage Update I: Does The Challenger Hellcat Still Do Grand Touring?